In it, he questions the THERAPEUTIC influences of the drug Gabapentin to the equine. He could be very correct on this, I just don’t know. I am neither a doctor, nor a scientist. However, from my personal experience with the drug, let me just say that therapeutically it has been a godsend. About 10 years ago I was stricken with a severe case of shingles, which struck the right side of my face. It ultimately resulted in my losing at least 50 per cent of the vision in my right eye. But the pain, oh the pain!!! It was absolutely excruciating. I was prescribed Gabapentin. When previously, my right eyeball constantly felt as though it was being rubbed with sandpaper, the pain was reduced to almost nothing by taking the prescribed six tablets of the drug daily. To this day, approximately TEN YEARS LATER, if I miss a day or two of it, the sandpaper-like symptoms return with a vengeance. If Gabapentin therapeutically produces the same pain killing results with horses as it has done with me, then I say let them have all they need. It sure hasn’t helped me to move faster though. RE: $46.00 exacta payoff at Western Fair (full story here). I have a simple solution for this. One which, in reactions I have gotten, is controversial at best. It is well documented that so-called “whales” in an attempt to keep the public from “coat tailing” their wagers, will “bet the bell”. In other words, hold their bets until the last possible moment. In effect these mega players are “hiding” their wagering intentions, which in my view violates the spirit of pari-mutuel wagering. Loosely translated, pari-mutuel means “among ourselves”. However, the ‘whales’ believe the pools are their exclusive playground. When asked about those playing the game far below their financial level, the general reaction is disdainful. In any event, I have suggested changes such as cutting off wagering when the last horse enters the gate. Or on the standardbred side, once the starter makes the final call to line up. This has been met with boos, hisses and rotten tomatoes. The whales screech “no fair!”… Their contention is the betting period should not end until the race “starts”. Fine. Of course race track managements fearing that if such an idea were enacted, the whales would take their money elsewhere. Fair enough, but if every racing jurisdiction in North America enacted the same rule, where are they going to go? To my knowledge, Hong Kong and Japan already do something similar. And if the whales want to stay up through the wee hours making wagers, I guess they can become day sleepers. Hardly a realistic alternative. The bottom line is track managements seem to be head in the sand on this issue and as long as the whales are pouring money into the pools, (only to take it right back out again WITH REBATES, I might add) everyone is blissfully happy. Meanwhile, interest in both breeds among the general public continues to wane. My guess is those $2 players and those who are regulars who may churn $500 to $1000 on race card are probably disgusted to the point where they have suggested no longer playing Western. Unfortunately there are not enough of “us” to offset the whales. So nothing changes. The whales are happy, and we get more of the same. Skinny payoffs, as we also get to witness the odds change three or four times during the early stages of a live race. Oh yeah, THAT. A huge bone of contention among most players. On that note, I understand how this works. It simply takes time for the data to be transmitted from the hubs to the individual track computers and then out to the tote board and monitors throughout the plant. But, we will never hear the end of those complaints. I have friends and acquaintances who have given up the game because of many factors. The major one is they feel the game is rigged in favor of the whales. That the $20 to $50 per race player is at a huge disadvantage. The whales get rebates which offset a portion of the takeout. Whales use sophisticated data sets and information that their computers churn out precise plays. That, there is nothing anyone can do about. And why would they? The problem here is simple. Move the end of the betting period up to the above suggestions and most of this goes away. I just wanted to thank the Meadowlands for giving me and other harness racing fans the opportunity to hear the unique and humorous race calls given by one of the best racetrack announcers in harness racing, Larry “The Voice” Lederman. On Saturday, January 12, 2019, Larry called all 14 races at the Meadowlands. In the past, he has called a few races a night, but not a full card. For those not aware, it is my understanding that Larry has had an inoperable brain tumor for a number of years, so to see him call 14 races is quite amazing. Here’s hoping I get to hear more of your wonderful calls for years to come. I just read the article about the closure of the racino at Monticello Raceway (full edition here pg 15). As stated, the long-term continuation of racing is in question. I have only visited this track once but do occasionally play their races by way of simulcast. This announcement should reinforce the call of all participants of harness racing that casino or racinos are not the salvation of racing. More needs to be done to promote racing and gambling on harness racing. Many of the harness tracks today are owned by casino-oriented companies. They usually only look at the racing product as a means to get or keep their casino license. If this trend continues we may be witnessing the end of major harness racing meets. The casino companies would like to just have casinos with no need to support racing. The horse owners, trainers, breeders and fans must keep pressure on their states to keep racing going by showing the positive economic benefits of racing. Unless we can increase the revenue to the state by increasing pari-mutuel tax revenue, I feel the revenue from casino gambling will win out. 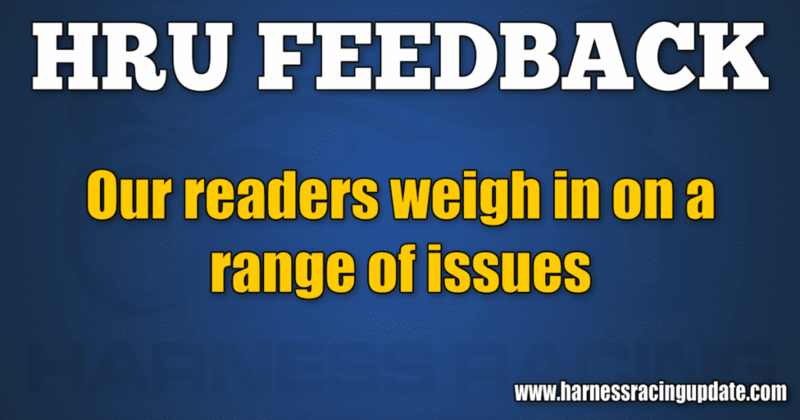 Thanks for your continued coverage of the harness racing industry.